Once you start thinking about labyrinths they crop up everywhere. Just recently the context was crime fiction, particularly of the noir variety (to be another blog, soon). The other night, it was memory, memories of a specific encounter, that between Danish physicist Niels Bohr and his former protege Werner Heisenberg, in September (or was it October?) 1941. As the protagonists, aided and challenged by Bohr’s wife, Margrethe, try to ‘follow the threads right back to the beginning of the maze’ (p.56), the answers they seek elude them as soon as they seem to be within reach. Michael Frayn’s Copenhagen, just ended at the Lyceum Theatre in Sheffield (part of a season of his work), entwines physics, philosophy and politics (and is the only evening at the theatre I can recall when interval chat in the bar concerned semiconductor-based quantum optical memories). The play starts with a question – why did Heisenberg visit Bohr in Copenhagen in 1941 – and the possible answers put forward by all three protagonists are diverse and contradictory, but not mutually exclusive (complementarity theory at work). Did H, then working in Nazi Germany, want to recruit B to help with their atomic weapons programme? To pump him for information about either the science or the progress being made by British and American scientists working in the field? To warn or offer him some sort of protection from Nazi racial policies? To seek absolution and forgiveness? Perhaps all of the above. But as they re-run and redraft the encounter, the moral certainties become muddied, and clear again, repeatedly. The play has been criticised for leaving us with these questions unanswered. For some, there’s no ambiguity at all – Heisenberg was a German patriot, who supported Hitler’s war aims, and his nuclear programme. Frayn’s human and conflicted portrayal is therefore a form of revisionism. I didn’t read it like that. The play allows Heisenberg to present a variety of self-justifications – his patriotism, arising out of the humiliation and deprivation that followed the first war, the fact that he did not tell Albert Speer how a bomb could have been made, the fact that he ‘never managed to contribute to the death of one single solitary person’. Unlike Bohr, who did make some contribution to the Allied nuclear programme, and thus played a ‘small but helpful part in the deaths of a hundred thousand people’ (p.91) at Hiroshima and Nagasaki. However, that Heisenberg presents those self-justifications, or allows them to be presented by the generous-spirited Bohr, does not mean that the audience accepts them, any more than we accept Heisenberg’s equation of the ‘impossibly difficult situation’ faced by Bohr with his own (p.21). When Heisenberg speaks of the hardships and devastations visited on his country after the first war, we surely cannot help but think of the hardships and devastation currently being visited by his country on occupied Europe. When he ducks the occasional challenges about the expulsion of Jewish scientists, about the deaths of fellow-scientist Goudsmit’s parents in Auschwitz (‘He thought I should have done something to save them. I don’t know what. So many hands stretching up from the darkness for a lifeline, and no lifeline that could ever reach them’), about the possibility of resistance (‘You think I should have joined the plot against Hitler and got myself hanged like the others. …What would it have achieved?’) do we let him off the hook? Hardly. And nor do Bohr and Margrethe. The only possible claim for absolution would rest in the suggestion that Heisenberg chose not to consider doing a particular calculation knowing that it would have shown the possibility of using fission to create a weapon. Everything we are told about Heisenberg’s character seems to make this unlikely. David Lindley, in his fascinating book Uncertainty, concludes that Heisenberg was ‘not the man to do practical nuclear physics or engineering’, and had genuinely never figured out how a bomb would work. He says that ‘this failure transmuted into a story that the Germans, meaning in particular Heisenberg, had turned away from the moral repugnance of building atomic weapons, or had even deliberately misled their political superiors about the feasibility of doing so. Heisenberg never exactly said this. He never exactly denied it’ (pp. 221-2). That he was prepared to allow this suggestion to remain in the air, perhaps even in preference to the suggestion of a scientific failure, scarcely redeems him. Similarly, when the possibility occurs to Bohr that Heisenberg had directly or indirectly enabled his own escape from Denmark, and those of thousands of Danish Jews – Heisenberg doesn’t confirm or deny this, not exactly. He says ‘Nothing to do with me, by that time. I regret to say’, but has earlier claimed Duckwitz from the German Embassy, the man who forewarned the Resistance of the timing for the SS roundup, and reported the entire patrol boat squadron unseaworthy on the night of the escape, as one of ‘his’ men. Strangely, Heisenberg (in the play) credits Duckwitz with having persuaded the Swedish government to accept the refugees, whereas other sources claim that it was Bohr himself who did so, delaying his own departure from Sweden to the US until he had won that concession. Uncertainty piled upon uncertainty. In the end, Frayn trusts the audience to draw its own moral conclusions. From an arts & humanities viewpoint, we tend to see science as a realm of certainties, of clarity and precision. But, to quote a physicist friend, science is not an exact science. However, what Heisenberg means by uncertainty is not the fuzzy thing that I might mean by it, even though one of the words he used – Unscharf – does mean blurredness or fuzziness. It’s about the limitations of measurements – the way in which precision in the measurement of one variable implies a reduced precision in measurement of the related variable, but ‘this ratio, the uncertainty relationship, is itself precisely formulable’ (Frayn, p.98). In relation to human memories and motivations, obviously, there isn’t a precise ratio. However, the basic principles that the observer changes the thing observed, that the act of observation determines what is and isn’t observed, lend themselves readily to wider application, and the uncertainty of thoughts is ‘a systematic limitation which cannot even in theory be circumvented’ (Frayn, 99). Heisenberg and Einstein clashed bitterly over uncertainty – the former insisted that we could not construct ‘an absolute, God’s eye view into the inside of an item’ but merely observe its behaviour, in various ways, and infer what we could from that, whilst the latter maintained that whilst observers might disagree, ‘events retain a distinct and unarguable physicality’ such that a consensus could be arrived at between apparently conflicting accounts and an underlying objectivity persists. (Lindley, 132). Bohr brought a particular perspective to this ‘inexactness’ – complementarity, the mixing of incommensurable concepts, which have necessary but contradictory roles to play – ‘an unavoidable disharmony’ (Lindley 148). Bohr and Heisenberg are incommensurable concepts themselves – Heisenberg who skis at speed down the slope, caring only that he gets there, that it works, never caring ‘what got destroyed on the way’, whilst Bohr does ‘seventeen drafts of every slalom’ (pp 24-5). Bohr revels in the contradictions, whilst Heisenberg lives and breathes paradox and contradiction but ‘can no more see the beauty of them then the fish can see the beauty of the water’ (pp 65-6). It’s often said that for evil to triumph all that is required is for good men to do nothing. In this case, just possibly, evil was thwarted by inaction rather than action. Had Bohr argued the science with Heisenberg in 1941, the latter might have realised the crucial calculation that would enable the bomb to be built in time for Hitler to use it. Margrethe suggests that this was ‘the last and greatest act of friendship’, to leave Heisenberg misunderstood. In the Lyceum production, as the final redraft takes place, and this time Bohr doesn’t walk away, but asks him why he is so confident that building a bomb would be ‘reassuringly difficult’, in the background we hear a low booming sound, increasing in volume as Heisenberg stops and says ‘Hold on’ and ‘a very different and very terrible new world begins to take shape’ (p.89). 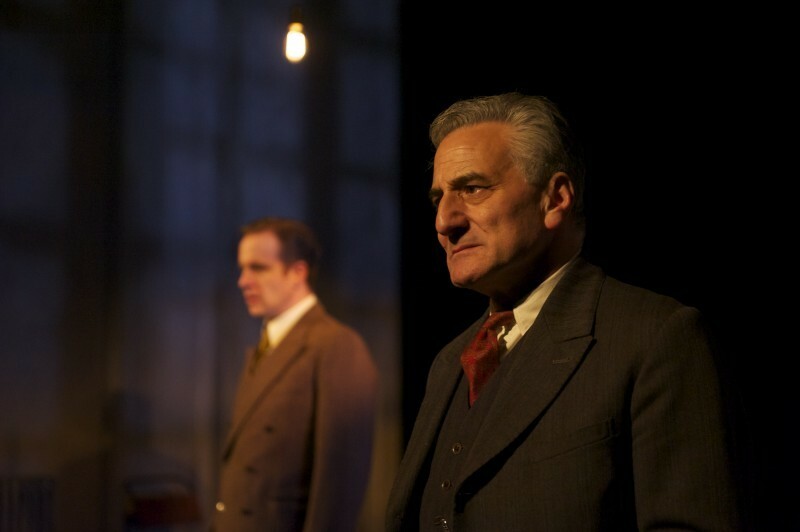 The Lyceum production was wonderfully performed by Henry Goodman, Geoffrey Streatfeild and Barbara Flynn, and, as Jonathan Brown said in the Independent, ‘the sheer intelligence of the drama and its subject matter is a thing of beauty’ (9/3/12). It makes demands on its audience, it challenges, but it’s also moving and haunting, and terribly hard to forget. If I’ve misrepresented science in any of the above, I humbly beg its forgiveness.